The brand is launching a highly anticipated minibus range, comprising of three model variants with two seating capacities, 11 plus driver and 16 plus driver. The new minibus models will be introduced on the latest Daily platform which features a clean-running Euro6-rated engine and a host of safety enhancements to add to the Daily’s already impressive array of active and passive safety features. Entry level to the range is the ‘Shuttle 12’ – it will be available on a 3520mm wheelbase and ‘H2’ roof (1820 mm standing height). This vehicle provides seating for 11 plus the driver and has a GVM of 4.5 tonnes. For additional carrying capacity there’s the ‘Shuttle 16’ which is based on a longer 4100mm wheelbase and provides seating for 16 occupants plus the driver. This variant also features the generous H2 roof ensuring there’s plenty of overhead height for customers both when seated and also when entering or existing the minibus. GVM for the ‘Shuttle 16’ is 6.1 tonnes. Although both these models are well appointed with a long list of comfort and convenience features, operators requiring an even higher end, premium finish can opt for the ‘Executive 16’. This 6.5 tonne GVM variant offers the same number of seats and wheelbase specifications as the ‘Shuttle 16’ but with a higher roof H3 roof (2010 mm standing height) for even greater headroom and extra feeling of space for passengers. Seating for the ‘Executive 16’ can be specified in leather and other luxury interior and exterior upgrades are also available for operators wanting an even more premium, high end look. Along with the roomy, standard internal luggage racks, a generous rear overhang on all models allowed Iveco engineers to allocate an extensive area behind the last row of seats for additional passenger baggage, in many cases eliminating the need to tow a trailer therefore reducing fuel costs, trailer registration charges and maintenance costs. This luggage area on all models is easily-accessed via the 270°-opening rear ‘barn’ doors. Powering the mini-bus range is IVECO’s Euro6, F1C, 4-cylinder turbodiesel engine with ‘Unijet’ common rail injection and four valves per cylinder. The power plant produces 170 horsepower (125kW) and features a flat torque curve with maximum torque of 400 Nm from a low 1,350 – 3,000 rpm. The engine meets the stringent Euro6 emissions measure with a combination of DOC and DPF control and boasts impressive fuel efficiency leading to lower operating costs. A slightly more powerful E6 engine is being slated for introduction into the range later in the year. Coupled to the engine is Iveco’s market-leading 8-speed full automatic transmission, delivering crisp and seamless power deliver and providing the driver with the important benefit of reduced fatigue, especially if operating in congested traffic conditions. All models also feature cruise control. On the safety front, all models are equipped with front and rear disc brakes with ABS and Electronic Stability Program. Iveco’s ‘ESP9’ safety package is also standard and includes a myriad of other safety features such as Electronic Brake force Distribution, Anti-slip Regulator, Drag Torque Control, Hill Hold Control, Adaptive Load Control, Trailer Sway Mitigation, Hydraulic rear Wheel Boost, Hydraulic Fading Compensation, Roll Movement Intervention and Roll Over Mitigation (see full description in table further below). Further adding to the safety equation is a driver’s airbag, Daytime Running Lights, a steering wheel with integrated controls, pneumatic suspension and a Lane Departure Warning (LDW) system. The LDW system uses a windscreen-mounted camera which recognises the road markings and sounds an alarm if the vehicle changes lane without the driver first signaling. To deliver a comfortable ride, all models are equipped with front independent torsion bar and rear air suspension – the driver is also treated to a heated, air suspended seat. Standard to the range is the touchscreen Iveconnect multimedia systems boasting radio, CD player, MP3 and DVD player, GPS and reversing camera. Other standard features include air conditioning including individual passenger air conditioning on selected models, which is delivered through air channels in the luggage racks. Also standard are three point seatbelts and the convenience of an electric bus plug door. A wide range of optional extras are available to further customise the minibuses to operator needs. IVECO Bus National Manager – ANZ, Steve Heanes, cites the Daily minibuses’ mix of safety features, Euro6 engine and full automatic transmission as key selling points of the new vehicles. "Many of these vehicles will operate in metropolitan and urban environments, so for the driver the 8-speed full automatic transmission makes for a much more relaxed driving environment leading to reduced fatigue," Mr Heanes said. "Safety is another important consideration in a minibus – the driver has the wellbeing of many people in his or her hands; the safety features in the new range are second to none especially with IVECO’s ESP 9 program being standard fitment and the introduction of new technologies such as the LDW system. "For the environmentally-conscious operator, the minibus range is equipped with one of the cleanest conventional diesel engines available, which meets stringent Euro6 emissions standards even though these measures won’t be mandated in Australia for several years." Mr Heanes said the Daily minibus has been developed to suit a number of applications where its specifications will compare favourably to others in the market. 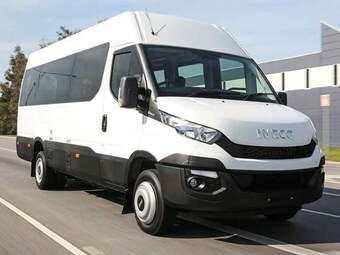 "IVECO Bus expects the new Daily minibus to find its calling in work such as airport and hotel shuttle services and related, as well as for medical-based applications including patient transport," he said. "The platform is also very flexible and provides for straight forward fitment of lifts and wheelchair access equipment for use in applications like disabled transport and for aged care facilities." The new Daily minibus range will be available from IVECO Dealerships during the third quarter of 2017.